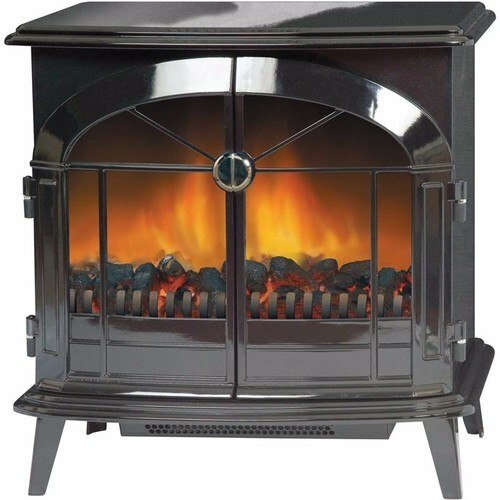 Traditional Style Cast Iron Stove Fire with Electric Log or Coal Burner finished in Glossy Black is an ideal Heater for use all year round. Comes with two heat settings (1kW and 2kW) and Optiflame technology for a real Authentic Stove Feel. The StockBridge Stove features removable panels for coal or wood, allowing you to choose your favorite fuel to burn while you enjoy heat and flame effects without the mess of a traditional stove. With opening doors, lighting effects, low sound output, and that real fire warmth, the SKG20BLN is as close to the real thing as it gets! Hello, my friend came to visit and she asked were i got this 'thing of beauty'! I must agree it really looks great. The great thing also is there was no mess involved in getting this installed. Happy with my purchase. Looks great in my mums living room, price was over £100 cheaper than other sites. Delivery took about a week but as such a good deal I was prepared to wait. Very,very pleased with this purchase. Recently removed irrepairable coal/wood burner ( Back boiler worn out )chimney flue needed replacing too. This fire supplies a realistic "real"fire effect and will be used mainly for its lovely warm & cosy look. What does removal panel mean in terms of the coal or log effect?